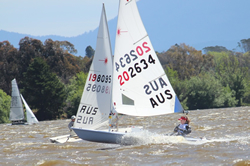 The Academy provides a range of opportunities for young people to participate in the sport of sailing in Canberra and compete interstate and overseas, while developing leadership qualities, and attaining recognition for their achievements. If you are unsure which class best suits your child, please contact the Sailing School Office for advice or refer to this progression guide. Download a full copy here. 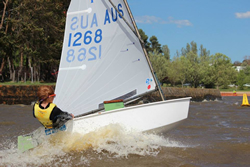 The Canberra Yacht Club Sailing School operates a five level Junior Sailing Program. The levels progress from a basic introduction to sailing, to an introduction to racing to finally a full racing program. The first four levels of this program are taught through the Youth Sailing Academy, the final level is taught as part of either the Optimist Race Squad or the Junior Youth Race Squad. There are 4 groups which make up the Youth Sailing Academy. These classes are discussed below. It is important to note that in all classes spaces are limited and positions in Gold and the Optimist Training Program are by invitation only. At the end of each term of YSA a progress statement will be produced for each student. If you are unsure which class best suits your child, please contact the Sailing School Office on (02) 6273 4777 for advice. The Silver program is aimed to extend student's sailing skill to a pre-racing level. Participants in this course will continue to develop and refine the skills that they have learned in the holiday courses (level 1). Successful completion of the Silver program will involve the fulfilling of the requirements of Levels 2 and 3. These levels are competence based and as such the rate at which students move through the material will vary. The majority of this program will be sailed in Toppers. This program is designed to allow students to develop their sailing skills in the International Optimist dinghy. There are significant restrictions on the size of students who can sail Optimists. As such, this program is offered as invitation only. The aim of this course is to enable students to develop their skills so that they can meet the requirements of Levels 3 and 4. It is hoped that students who complete Level 4 will move into the Gold program, the Optimist Racing Program or the Junior Youth Racing Squad depending on the Coach's recommendations. This program is designed to get the students to develop their current skills from basic sailing into racing. Gaining the basic knowledge about racing and allowing them to ease into the club racing. 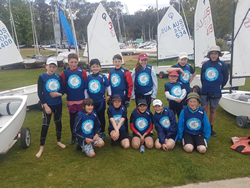 The students will be working towards their level 4 in sailing, after they have completed the course they can then go into either the Optimist program or the Youth Racing Squad which are both invitation only. This course will be run in toppers. 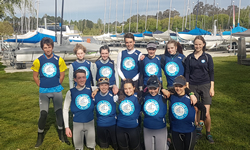 The Canberra Yacht Club gratefully acknowledges the generous support provided to the Youth Academy by The Canberra Southern Cross Club and the many volunteers, family and friends of the Academy.